Nicolas Sanson's Map of Libya. Made in the year 1679. Nicolas Sanson's map of Western Africa and the Sahara desert. L'Afrique, ou Lybie ulterieure : ou font le Saara, or desért, le pays des Negres, la Guinee, et les pays circonv., tirée en partie de Sanut, et de l'Arabe du Nubie : en partie de diverses cartes veues, jusques a present : la coste de Negres, et Guinee, &c. est apres les observations de Samuel Blomart / par le S. Sanson d'Abbeville, geogr. ordre du Roy : avec priuilège [i.e. privilège] du Roy pour vingt ans : I. Somer Pruthenus Scupl. A handsome map, all-told. I like it quite a bit. I think “the Arab from Nubia” is al Idrisi. 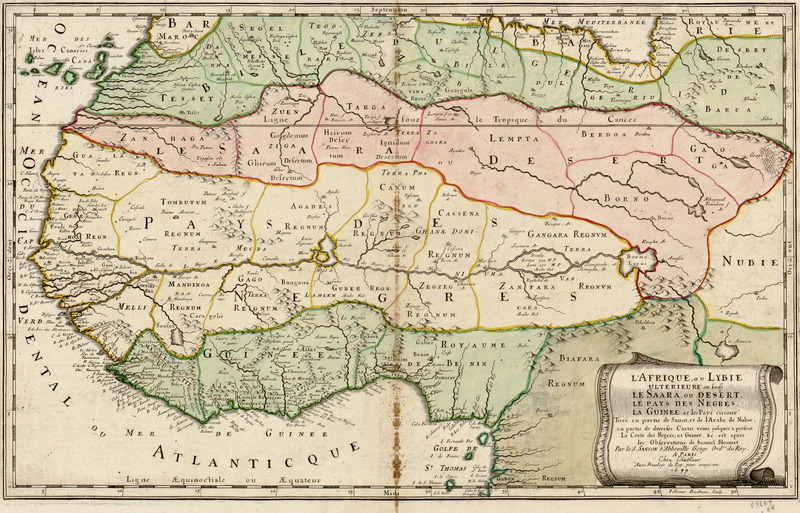 AFRICA, or further LIBYA : where are SAHARA or DESERT, the COUNTRY OF “NEGROES”, GUINEA, and surrounding countries. in part made from maps already seen. The “Negroes’ Coast”, and Guinea, etc, are drawn from the observations of Samuel Blomart. 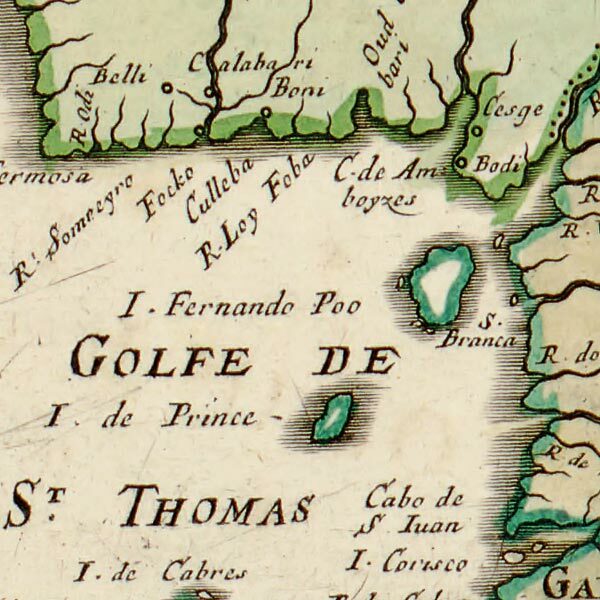 Drawn by Sanson d’Abbeville, King’s geographer. In latin : Johanes Pruthenus Somer engrave it. ** The Arab of Nubia was an other geographer, but I didn’t find anything about him. Many thanks for your translation help, Clem. It’s very edifying, and it is much appreciated.